Here is the dealio with my pastime wear, a) one pair of jeans, b) t-shirts, c) furthermore, t-shirts that I pick up from the free pile at the practice space, and d) sometimes I cut them up. I have my work and home and play wear calculated per my (n x 2) + 2 = x formula, but pastime wear is a catchall for worn-out leggings and the aforementioned free t-shirts. Because it's nice to have uncounted areas in a mostly counted life, and also because I don't go out much. Or dress up when I do. And on top of that the last time I cleaned my bearings, I spilled acetone on my one pair of jeans so my one pair of jeans has a big bleached out spot on one leg. And also they're too big, because I lost weight. I bought a belt, actually a pretty cool belt. 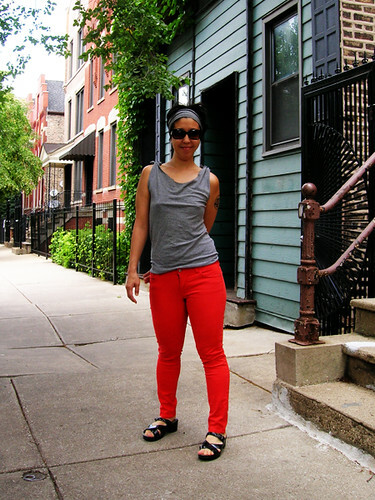 This doesn't normally happen, but last week on the free pile there was this pair of fury orange skinny jeans! I'm never looking for jeans in the free pile, why would I need jeans, I already have this pair of too big bleached out jeans. I don't know why I grabbed these up, I mean I guess because orange. Because orange and skinny, maybe these could be my nice jeans? I have never owned skinny jeans before, I couldn't imagine how I would even put them on; but these were size 10 and maybe that's how, that's probably what I was thinking. Now I know, the fabric is super stretchy. And apparently I am a size 10 in skinny jeans, they pretty much fit perfectly. They go on, they're actually comfortable, and I don't have cameltoe. Meh these Dansko sandals are okay with this, better than my Converse All-Stars that I've been wearing all summer with everything since I sprained my ankle. I may not have told you that I sprained my ankle at the beginning of summer, somewhat badly, from—wait for it—falling off the sidewalk, yay me. It healed quick enough to be back to skating, in a brace, within four days and back to walking normally in about a week or two. But it was like getting sent down a chute in chutes and ladders for my balance work, tch I was up to brushing all my teeth standing on one foot with my eyes closed, and that sent me right back down to zero. Anyway I've been happier this summer to have my feet as flat on the ground as possible. Even though these jeans really want to be worn with heels, oh well, I don't do heels. This t-shirt with matching headband is an old Hanes t-shirt that came in a three-pack, it's been one of my favorite sleep shirts forever and then I needed a shirt I didn't care about to wear in the tomato fight, and as long as I was going to ruin it in the tomato fight, I might as well cut it up, it has a cylon back like my golden bowl t-shirt and I tied off the shoulders to make it drape better. 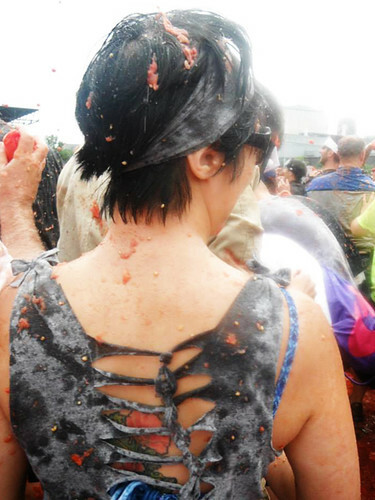 Here's what the back looks like, uh, covered with tomatoes. Photo by Dinah Party.